About ...after rain for my friends! All my best wishes dear Mohamed! I like the raindrops and the crop. nagyon kellemes szinek. Egyszerusegeben tokeletes. A legy meg hatasosabba teszi. Gratula! Thanks for your very kind comments and your visit. The fly adds a nice, original touch. What a delicious tones and compo! Thanks for your kind comment dear Ann! I really appreciate it! Very nice abstract, Robert. Love the colours and the mood of the they evoke. Congrats on your award. Very well deserved. Cheers, Ann. Thanks my friend for your kind comment! It's a wonderful composition and very impressive..
Also congrats for the "BIP".. Thanks for your kind commnet dear Cessy! very nice composition, with the lines and water drops. Thank your Roby! I really appreciate it. and this one have captured also the BIP in a perfect just BIP well deserved it! look it have also a little fly! I can't remember if I have commented on this one before but I want to again anyway. Great capture and deserving award. Thanks also for your comments. Thanks for your kind comment and I glad you liked it. Thank you very much dear Laurie! Nem uncsi ez a sok BIP? Én sem tudok mást tenni, mint egy "szavazattal" hozzájárulni. ui: ...holnap siess! ...próbálj meg beérni fél kilencre! Thanks for your hearty comment dear Linda! I really appreciate it. Thanks for your comment dear Angelo! I appreciate it. I really appreciate for your very kind comment dear friend! Thank you very much! Thanks for your kind comment dear Tiro! I appreciate it! Hát Robikám, ezt nem lehet különösebben tovább ragozni, fenntebb ugyanis minden elhangoztatott már... Egyszerüen csak ismént alkottál volt valamit, csak úgy ösztönösen, zsigerböl ahogy szoktad! Ezt szeretem benned, mert tudom, láttalak már fotózni, hogy mily játszi könnyedséggel és derüvel teszed mindezt...! Úgyhogy nincs más dolgom mint újra csak emelnem kalapom s gratulálnom néked :)) !!! Very well observed, Robert. Cool results, excellent details. The fly is an interesting inclusion. I am not sure what it adds to the shot, and actually think that it detracts from the main abstract theme of the raindrops on the window. Congratulations for the very well deserved award. You do these so well, and the BIP is well deserved. And once again it is a minor detail in your picture that makes the difference - that little fly in the upper right corner.. :-). So great. The raindrops are perfect in clearity and details... excellent abstract in my opinion. Thank you very much for your kind commnet Engy! Thanks dear Judi for your comment! I appreciate and thank you very much for your wonderful comment dear Ameed! Wonderful capture with excelelnt details. Only a sensitive eyes for details can capture this Roberts and you have those eyes, very well seen and captured, i like the details, tones, and the wonderful sepia color. Thanks for your kind comment dear Roberto! I like the fly details too! Thank you for your very kind comment John! I appreciate and thanks for your kind comment dear Toshi! There is a very strong contrast between the blind and the glass with the raindrops. And the fly adds that extra littl bit of interest. Wonderful tones set the atmosphere. 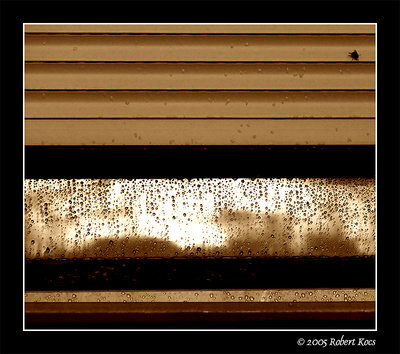 Love the raindrops - great abstract shot Robert! Thanks for your kind comment dear friend! I really appreciate! Thanks for your kind comment Jani! Thanks for your kind comment Judith! Thanks for your kind comment dear Carolyn! I appreciate it. Very good details, wonderful work!!! Thanks for your kind comment dear Rashed! Beautiful composition. Very nicely executed! I love this! The atmosphere is wonderful and you caught all the detail in the drops, very dramatic and creative!